Michigan regulates the sale of beer, wine and “spirituous” (hard) liquor through state statute and rules promulgated by the Michigan Liquor Control Commission. As part of this system, state government intervenes in the spirituous liquor market as a monopoly wholesaler, a role it has filled since the end of Prohibition. The state also mandates that most suppliers of beer and wine grant exclusive sales territories to a select group of wholesalers. These and other restrictions artificially raise prices and reduce the availability of alcohol to Michigan’s consumers. Last year, a state Liquor Control Advisory Rules Committee was charged with developing alcohol control reform proposals. Some critics, however, have cautioned that the state’s present alcohol laws are necessary to protect public health. 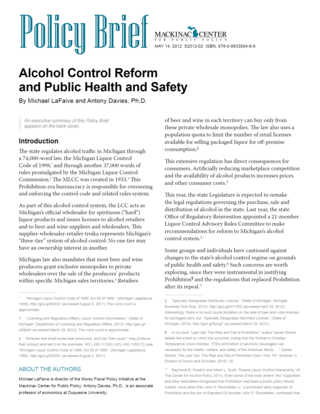 This Policy Brief examines the health and safety effects of alcohol regulations like Michigan’s.